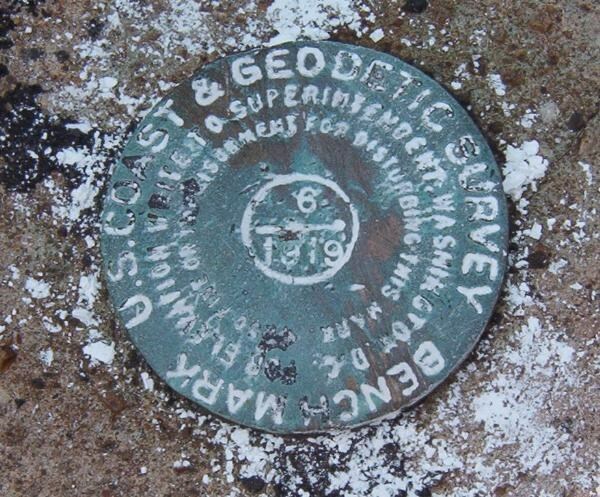 For several years I have been researching the many different types of survey disks used by the U.S. Coast & Geodetic Survey, and since the name change in 1970, the National Ocean Survey (later Service), and the National Geodetic Survey, both under NOAA. 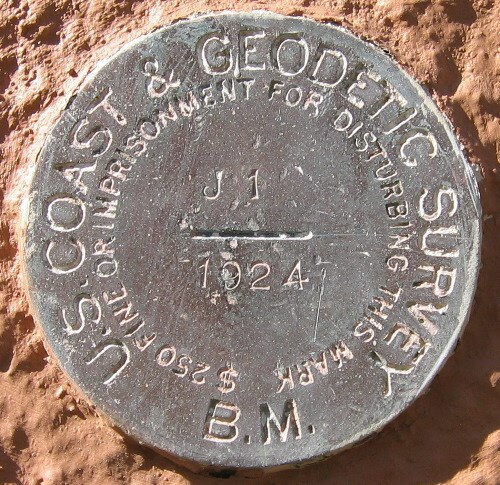 Note, this does not include U.S. Geological Survey disks since that is a separate agency. I have reviewed all of the several hundred USC&GS Special Publications and many of the USC&GS Annual Reports and other surveying documents. 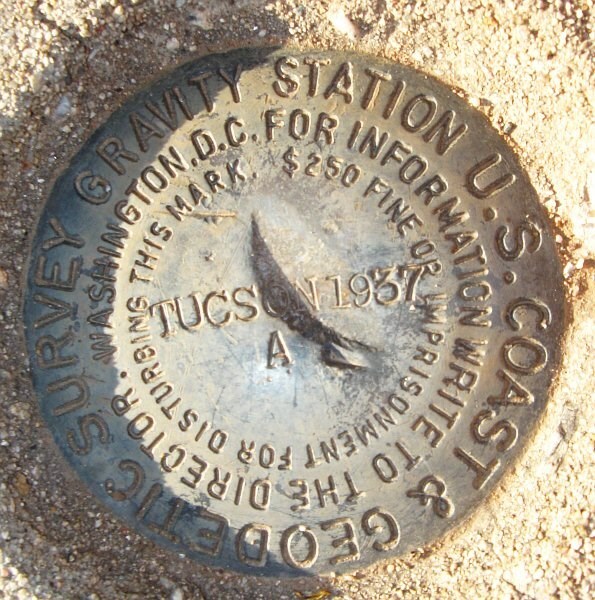 My current main source is the many photographs submitted to the Geocaching web site by all you avid survey mark hunters. So, I’m asking for help and will even offer rewards, or prizes, if you will. What I’m looking for are photos of marks outside the date ranges in the table below. The date has to be the original date set, not a replacement or reset disk set later. One prize will be awarded for each category in the table. The prize is a USC&GS 200th Anniversary lapel pin, see photo at: http://www.flickr.com/photos/12262796@N06/3311544961/. The pin is about 1 1/8” top to bottom. The flat-topped disks were perfectly flat on top, not slightly convex. The upper case letters in the table represent the actual stamping on the disk. As always, high quality photographs are desired: sharp focus, even lighting, disk completely cleaned off, good exposure, etc. Submit all entries to this thread and include, at least, photo, year, state, and PID. 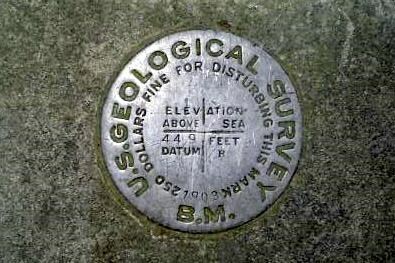 I may wish to include some of these photos in my paper on survey marks, so I would appreciate permission to publish any photo submitted. I will give photo credits to the photographer. Apologies for above post, which was made in haste. We see that you want disks OUTSIDE the dates in the list. I'm not sure whether NGS Surveyor meant the date ranges to be inclusive or exclusive, so I'll let him clarify that. I kind of think he meant inclusive. Depending on what he meant, some of these may be out of bounds. The following are disks I have recovered which I have made known to this board in several posts over the years and to NGS Surveyor by email, so I would ask that these NOT be eligible for any prizes. If I find any new ones, I'll be sure to post them. Permission is hereby granted to reproduce these and publish them in any medium with appropriate attribution. Dates: the data sheet says "1903", the disk is stamped "1908". 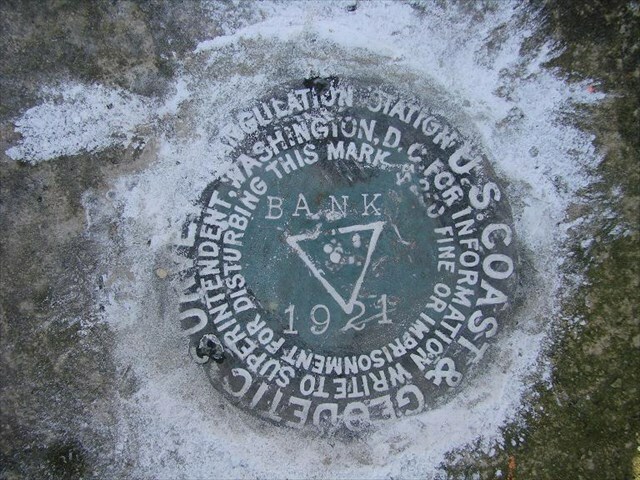 the concrete outside the disk is chiseled "1907" and the disk was overstamped "1932" by a later party. (Is that enough? ). Date: 1909 (from the data sheet), disk stamping is illegible. This is in lousy shape. Harry Dolphin has a much better specimen (QF0712) which he found about 5 miles from this one. Dates: set in 1913, overstamped "1860 - 1935" by a later party. This is a reference mark set in 1913 to reference the station Quoddy, which is a copper bolt set in 1860. 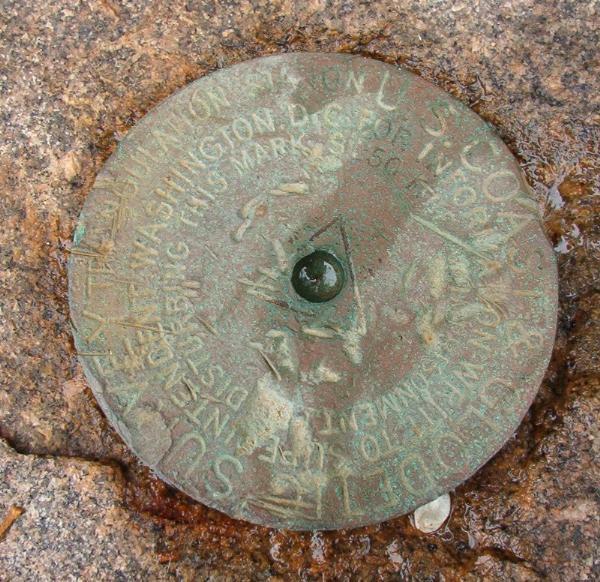 This is a Transit Traverse disk set in 1934 which references the Massachusetts North Base station, which is a copper bolt set in 1844. I'm looking for dates OUTSIDE the range I gave in my first email. 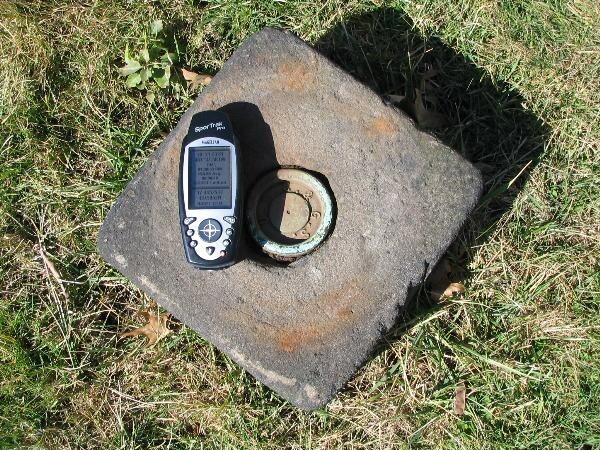 For example, we have found samples of the cast iron disk from 1943, 1944, and 1945, but no other years. I have been caught. I made a mistake in the Table in my first post. Entry "B" should be "B.M." and not "BENCH MARK" since on these very old disk only the initials were stamped. Not sure it is the exact one you need. Permission granted if you can use it. Taken in Oregon in 2004. Edit to add: OOPS, it looks like you want disks outside the dates given in the original post. If so you already have an example of this one listed. 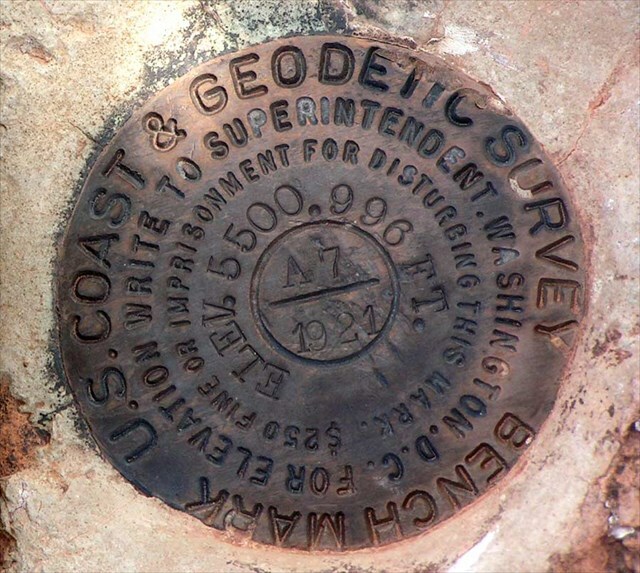 The Bean Team, Thanks for the post, but your survey mark is a U.S. Geological Survey disk and not a U.S. Coast & Geodetic Survey disk. Sorry, close but no cigar. How bout this one. Does it fit any of your needs? I suspect it is from the 1930's but the structure's corner stone is for 1909 and its monumented date is UNKNOWN. For the "USC&GS AND STATE SURVEY" disks, I'm trying to determine if they were set in any years other than 1933, 1934, and 1935. Submit all entries to this thread and include, at least, photo, year, state, and PID. 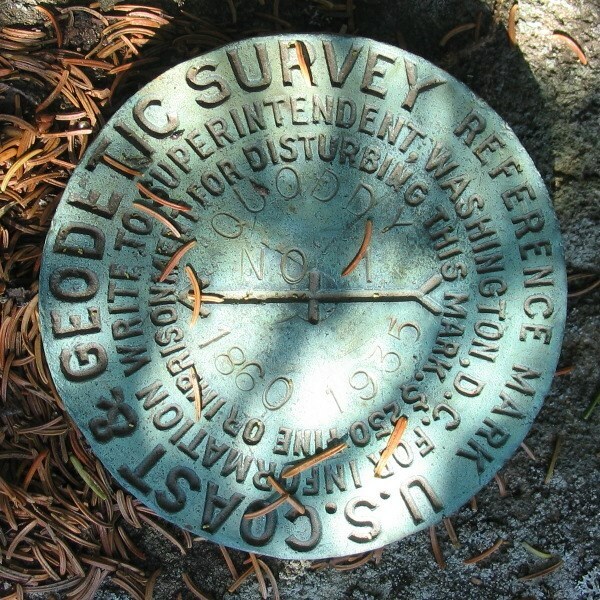 I may wish to include some of these photos in my paper on survey marks, so I would appreciate permission to publish any photo submitted. I will give photo credits to the photographer. Just being literal. PID RD1728 is an NGS Disk that was NOT SET PRIOR TO 1972. Recovered in Oregon 1/27/2008 Once again, you may publish any photo that I have posted to Groungspeak. Did I mis-read - I don't see a size requirement listed on the info. So, would this be acceptable or is it too unevenly lit ? The low sun did help emphasize the lettering. When did they change from the flat-top to the slightly convex - I don't remember and can't be sure from the photo if this was flat or not. I know you know about these, but they are not in your list and differ from the other Bench Mark disks. 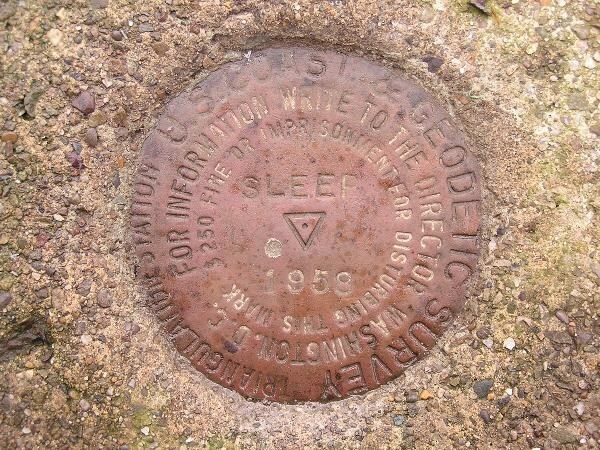 Neither type has the line "WRITE TO SUPERINTENDENT, WASHINGTON D.C. FOR ELEVATION" which other Bench Mark disks have (but the do have the line about the $250 fine). 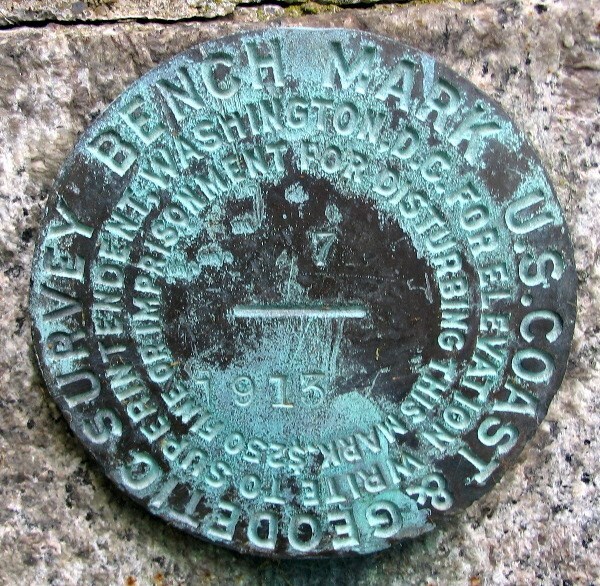 Flat topped bench mark disk engraved "B.M." not "BENCHMARK" with a short line in center. Dates? Convex pipe cap engraved as above with a circle in center. Dates? I changed several of the items in the table, especially B. The dates in the table are the known dates that a particular style of disk was used (from recoveries and photos). So, I am interested in photos of any disks outside this range of dates. The flat-topped disks are all from before about 1925. These disks are completely flat on top, with no rounding even at the edge. Dixiedawn, Your photo is excellent. The side lighting highlights the stamping very well and the size and sharpness of the photo are excellent. However, the disk is not one I need. Papabear, It appears that the flat-topped bench mark disks came in several variations. In the center, they may have had a single slash, a circle, a square, or a circle with a slash inside. I have expanded “B” to include all of these. 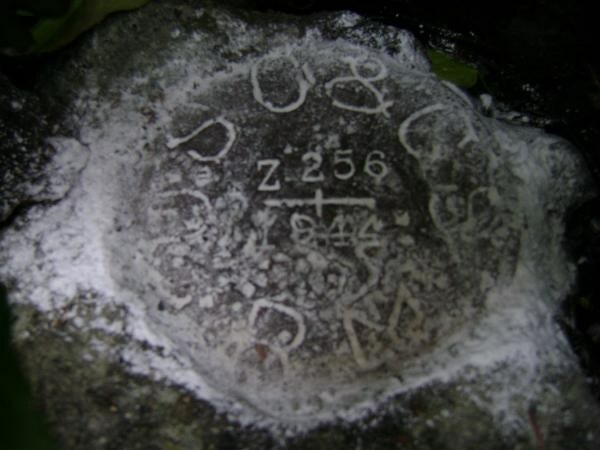 As we have discussed via email, it appears that for a time, the bench mark with a slash in the center had a stem and was used for bench marks set in the side of buildings, and that the bench mark with a circle in the center was a cap and had threads for screwing onto a pipe buried in the ground. In the USC&GS publications I have found two mentions of a disk with a square in the center but have never seen one or even a photo or drawing of one. I don’t have good dates for any of these variations. This would fall under unique. I have not seen any listed in any other location in the NGS data base. You may have it, but it is one of my favorite. One of the most unusual disks I've seen to date... similar to the one posted by CallawayMt. Thanks all for the photos. 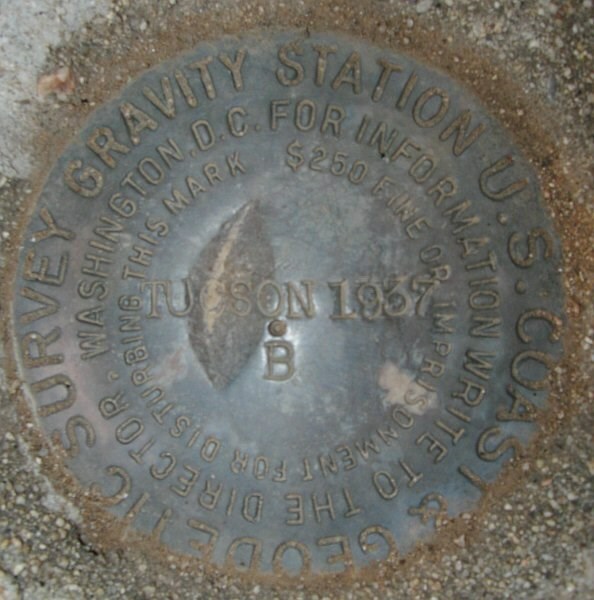 CallawayMT – Your GRAVITY STATION disk is very unusual, I’ve only ever seen three (I have an unused one on my desk). They were used from about 1936 to about 1970. Difficult Run – Your GRAVITY STATION reference mark disk (with the arrow) is very, very unusual, I’ve never seen any! I do have a photo of one. They were used from about 1936 to about 1961. 2oldfarts – I don’t think your disk is flat. Notice how the sunlight only lights up the top portion of the disk. The “flat” disks were completely flat, for a photo of two from a 1921 pub. see: http://www.flickr.com/photos/12262796@N06/3343702001/. In about 1921, five convex (curved top) disks were introduced, see: http://www.flickr.com/photos/12262796@N06/...in/photostream/ also from a 1921 pub. Your 1921 disk is from this 1921 transition period when the disks were changed from flat-topped to convex. I think yours is the disk in the upper right. VagabondsWV – Your disk qualifies under “A” and is VERY rare. The only one I’ve ever seen is mounted on the wall in the NGS office in a display. However, I don’t understand the setting date of 1944 that the description states. To my knowledge, these old “cup” shaped disks were only used from c1900 to c1912. Do you have another photo without the shadow over the disk? 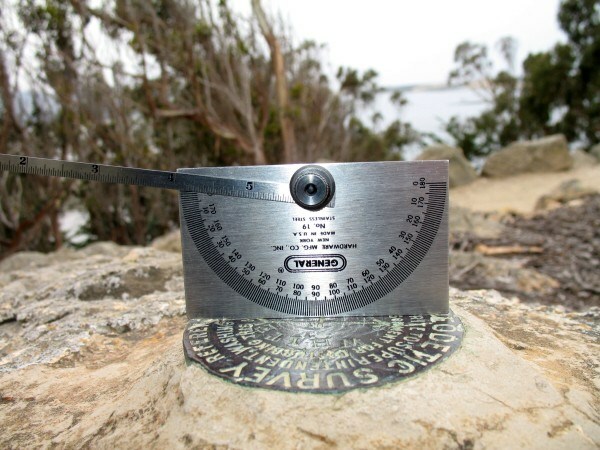 Could you send me the latitude and longitude that your GPSr read? Did your GPSr position agree with the description’s position? 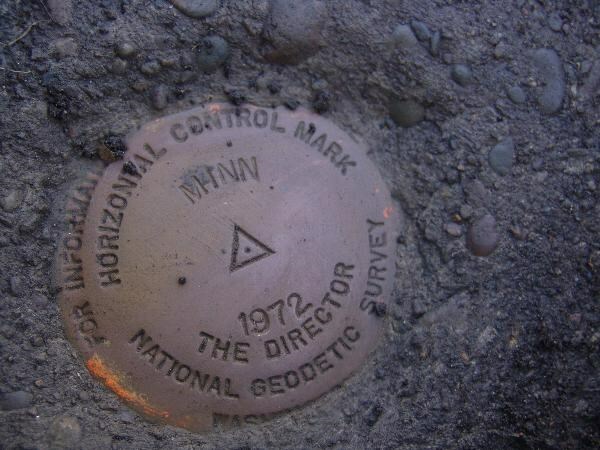 Did you find the reference marks and azimuth mark? Did they agree with the description? What factory and user stamping is on those disks? 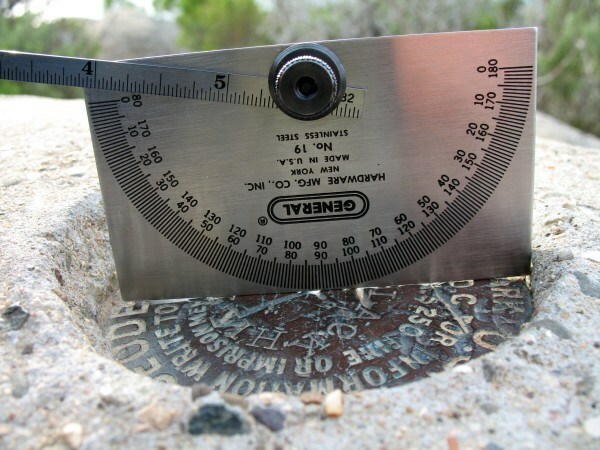 Did you check the distances and directions from the main disk to the reference marks? Did they agree? If everything does agree with the description, then possibly some USC&GS surveyor found the old disk at the bottom of his box of disks and decided to “use it up”. Very interesting! JX1725, which also dates from 1944. VagabondsWV found JX1725 as well. Both are in West Virginia. My photo of JX1725 has shadows as well, but you are welcome to use the photo. 2. 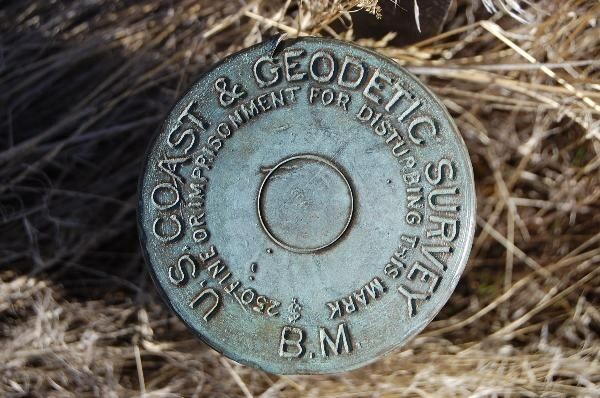 As I suggested earlier, perhaps the 1944 surveyor found a stock of these very old "cup" type disks and decided to use them. I finally found my backup CD of 2005 photos, and no sorry, I do not have a better photo of the station. Enlarging the original photo I can add this tho. The disk is indeed not stamped – no user markings whatsoever (shadow not a problem on the original). The Lat/Long as recorded by my handheld is 38-21.232 / 81-37.583 State Plane NAD27 UTM 17 E445254, N4245052. I did not measure the distance between the station and RM#2 however the setting/description looked accurate. RM#1 had been covered over by a cement capping by a previous landowner. The Azimuth mark is destroyed as the old sidewalk was completely removed along with everything else in the block – new building, sidewalk, streetscaping changed everything. I had forgotten about the Magnetic station in Parkersburg until Wister6813 posted. Yes it is the exact same style marker. Interesting that the Charleston disk is described as a “Bronze Disk” while the Parkersburg Station is described as a “ U.S.C. and G.S. Standard Magnetic –Station Disk”. Also while JX1725 states it is stamped 1924 no such stamping. is evident in any of the photos that various people have taken of it, it also is clean just like HX3058. VagabondsWV, I did an “inverse” computation between your GPSr position and the published position for CHARLESTON MAGNETIC and got 5.6 meters. (Using the “inverse” computation on the NGS WWW page.). So, the mark you found is most likely the correct mark – I thought there could have been another nearby mark. I plan to stop by one of these on my next trip to Ohio. 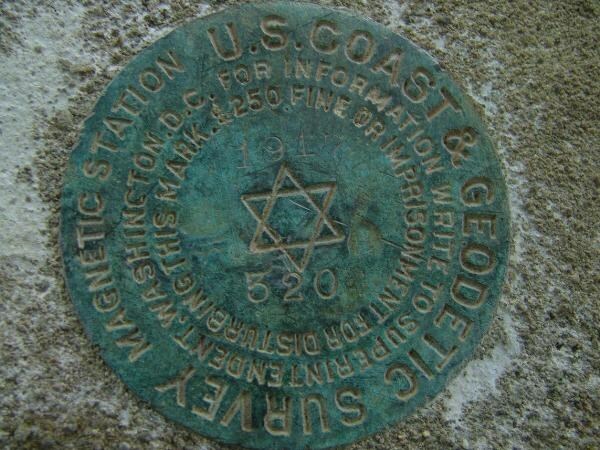 Regarding the MAGNETIC STATION disk, they came with the 6-pointed star in the center. They were used from c1921 to c1970. Here is a six pointed star MAGNETIC STATION set in 1917. Mega Scooter, Very nice find! Your disk appears to be flat-topped and is 4 years earlier than the start date I had given. I looked back at my spreadsheet of disk type history and the dates I gave earlier for the MAGNETIC STATION (MS) disks were for the curved top MS disks. The flat-topped disks were listed in my spreadsheet but I missed them in my quick review. The flat-topped MS disk first shows up in a USC&GS Special Publication in 1912 (S.P # 15, page 23), see: http://www.flickr.com/photos/12262796@N06/3351680168/. It appears in a photo again in S.P. #20 in 1914. A disk is mentioned with no photo in S.P. #51 in 1918. Then in 1921, a set of five curved top disks is first shown and includes a MS disk (S.P. #74). So, your disk is the earliest MS disk that I have seen a photo of, thanks! This may be one of the cast iron disks set during the WWII years and if so, then I am sure that you have plenty of pictures of them. The distinctive feature for me is the lettering around the edge of the disk. The letters "USC&GS" are much larger than usual, and the letters"BM" are also in the edge lettering. TR0548, along State Highway 20 in Jefferson County, WA. 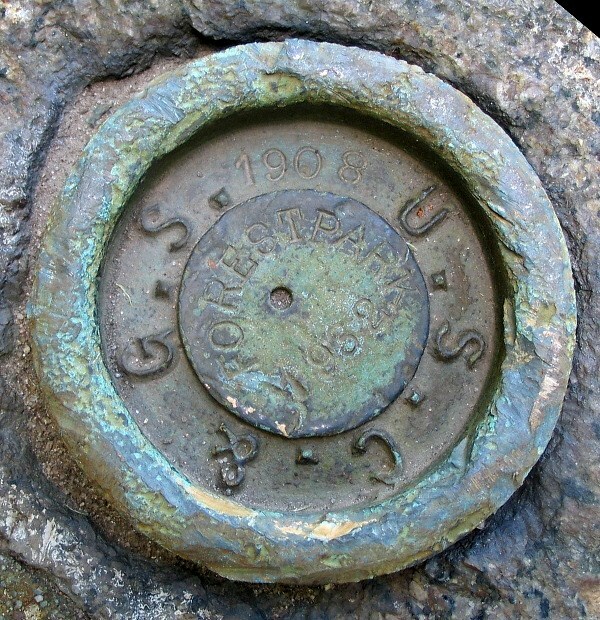 Yes, your photo is of one of the cast iron disks from WWII. I read somewhere that the letters were larger because they couldn't cast small letters in the iron disks. GG0638 - Photographed by RazorbackFan on 12/22/2006. 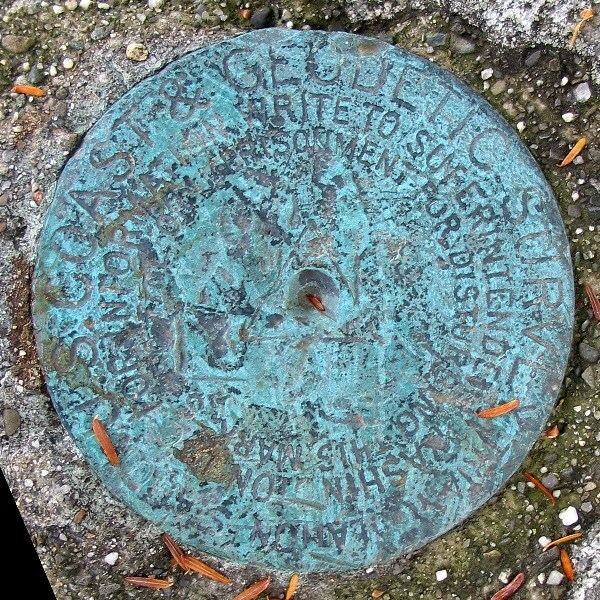 "The north end of the meridian line, about 275 feet long, is marked by a brass magnetic station marker (1923) embedded in the wall of the schoolhouse, about 4 feet above the ground." Shorbird, Which part of the stamping did you mean was unusual, the name SLEEP? This disk is a little unusual in that it has the air hole just above the "1" in 1958. 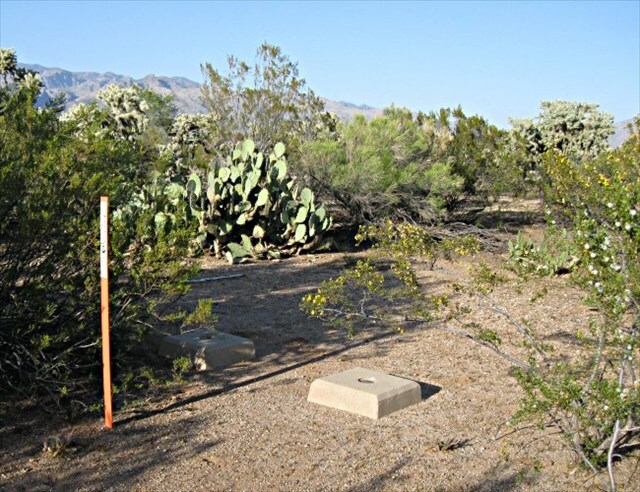 This air hole was used in disks for several years in the 1950's until it was realized that some people were setting up their survey instrument over the hole instead of over the center of the triangle! As Papa Bear mentioned: flat disk from 1909. USC&GS and State Survey 1956. I ran into several like that with the hole up here in da UP of Michigan. We always wondered why that there. Asked several NGS people and they have never seen one like and did not know. I wonder if you ever ran across what I did once. 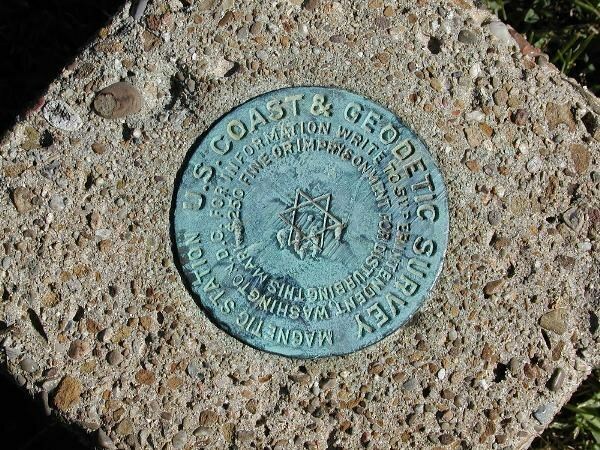 I (MDOT Tech) found a destroyed Tri sta and when I broke the disk out of the monument I found that under the USCGS top was cast with the USGS legends. 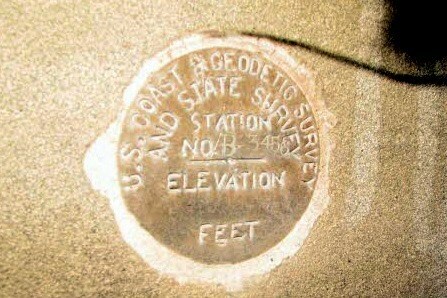 One side USCGS other side USGS. I wish I would have kept that disk, as far I I know the state advisor got it (RL Ramsey-retired). The stem was soldered and because of the double stamping the disk was flat and very thin. 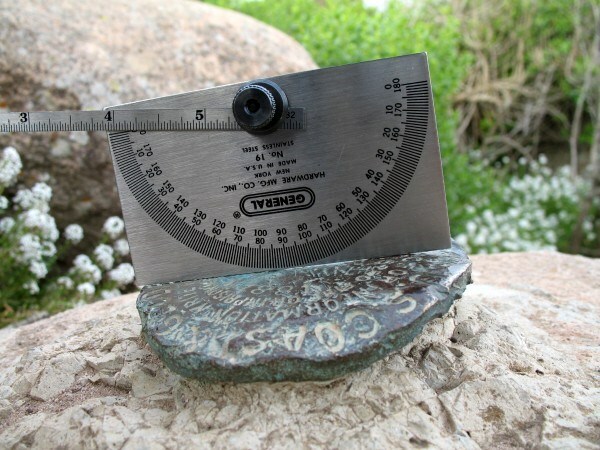 North-South stones (for compass calibration) were established in nearly all of North Carolina's 100 counties between 1885 and 1905. 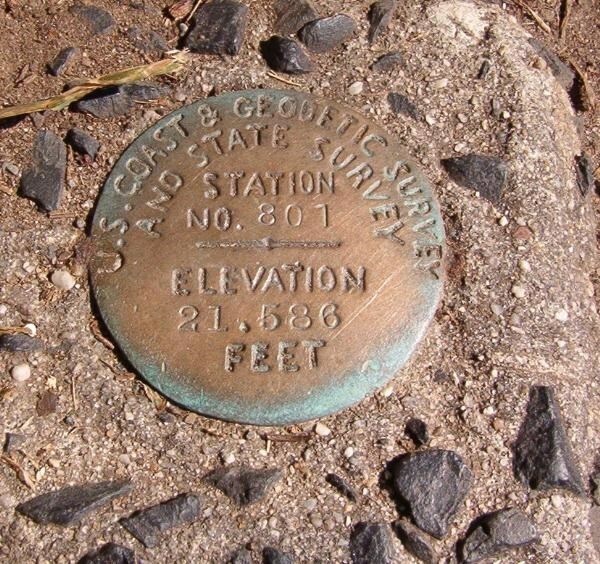 A surveyor was required by law to visit the station in his county once per year. His readings were then recorded in a special book at the Register of Deeds office at a cost of $5 (which was a steep fee in 1900). Interestingly, within the next five to twenty years, most of these special purpose stations were rendered useless by construction of nearby roads and buildings. Some were relocated to safer locations, such as cemeteries. (No small task, since each monument weighed about 400 pounds!) 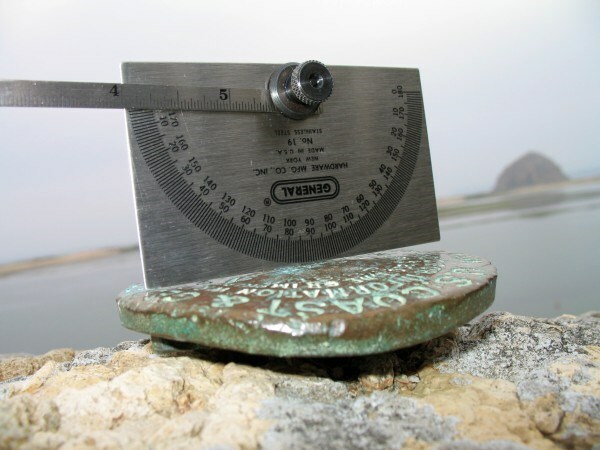 The newer magnetic stations were metal disks, just like the photo you posted. 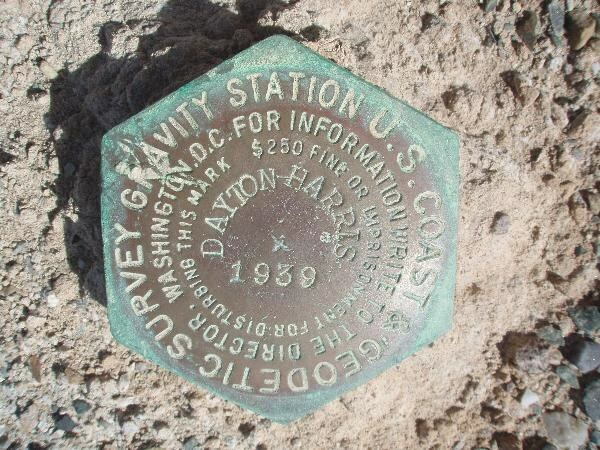 About three years ago, surveyors and laypersons began the process of determining how many of the old stations have survived. A few stations have PIDs. Otherwise, there was only one source of information. It was the Report to the Superintendent, published in the early 1900's. But six months ago, a group of students at a university began digging for more data, and the book you referenced came to light. Since then, reports for additional years have turned up in libraries. These have been scanned and can be read on the NCGS website. Sometimes, we "Go for the Gold" by attempting to find an original station, as well as its replacement. (From the drop-down box, see Orange County--Chapel Hill.) 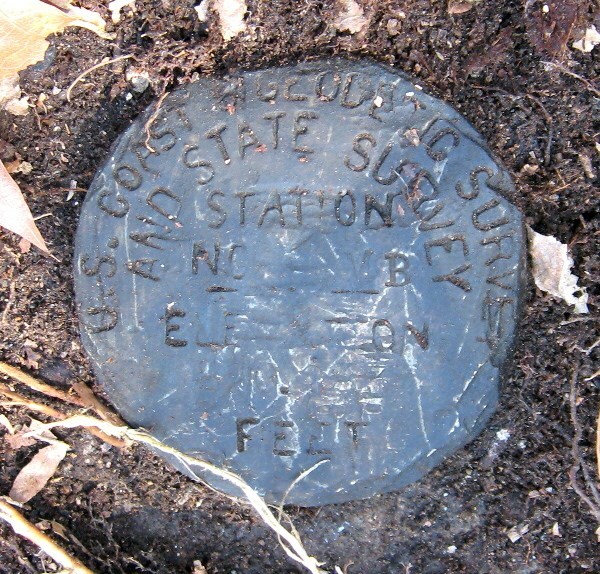 Meanwhile, for a very interesting description of how the invention of the telegraph influenced surveying, look at the Wake County entry for the Longitude Station on the grounds of the State Capital building. 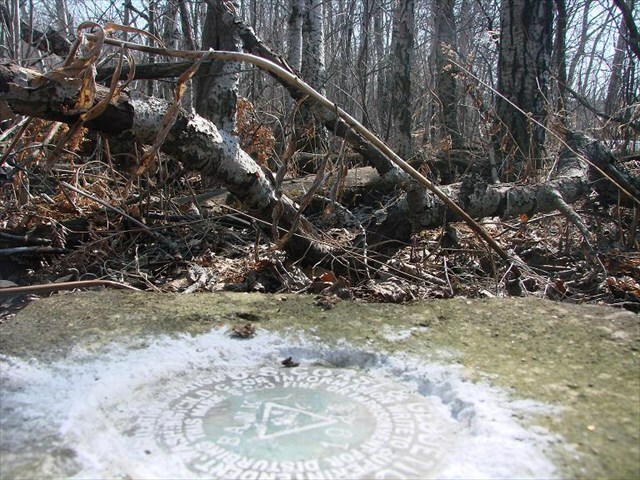 The author is Curt Johnson, of the NCGS staff, and he includes some amusing newspaper articles describing the public's theories about what the stones symbolize. 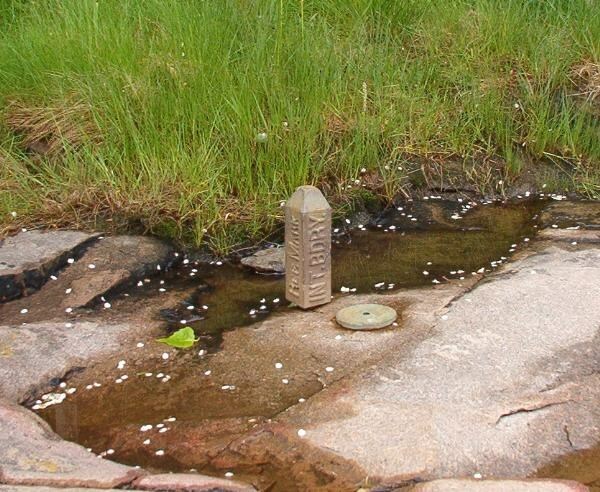 One that didn't get into print was from a gardener at the University of North Carolina who was surprised to find that the granite marker she'd been landscaping around was not a grave. "You're kidding," she said after I explained the stone's purpose. "That thing has given me the shudders for 15 years!" Shorebird – In my comments several days ago I mentioned that the hole in the disk was an air hole, but I forgot to explain what the air hole was for. The theory was that the hole would allow air to escape from behind the disk as the disk was pushed into the wet cement, resulting in cement completely filling in the concave area behind the disk and making a stronger bond and hopefully a disk harder for a vandal (or nature) to dislodge. Harry Dolphin – The 1909 disk indeed looks flat. 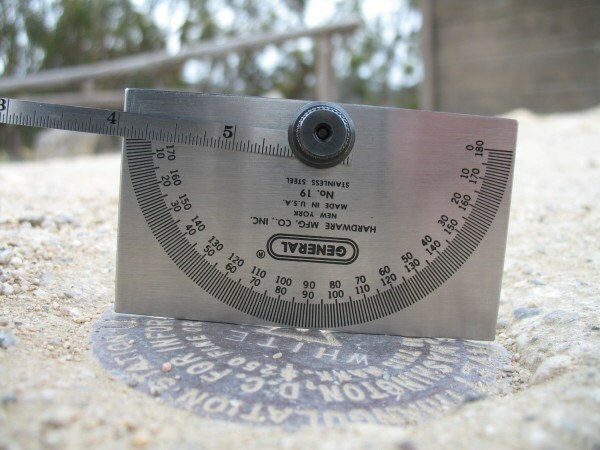 I’m waiting for someone to take a photograph of a flat disk with a ruler laid across it to prove that it is completely flat. 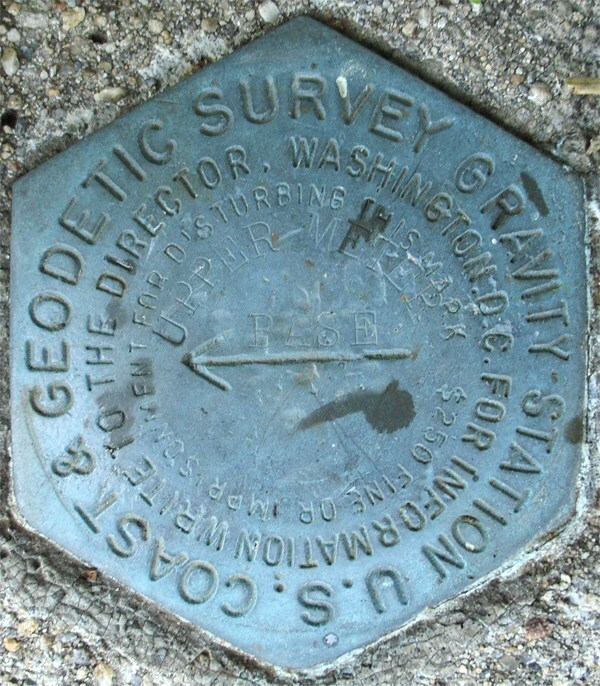 Your photo of the USC&GS AND STATE SURVEY disk really caught my attention. The 1956 date seems completely out of place since I had only heard of this type of disk being set during the 1930’s. I looked at the description and it has 1956 all right, BUT, it has two entries with the 1956 date, one entry that the disk was set in 1956 and another that it was recovered in 1956. This is possible, but somewhat unlikely. I have often seen the datasheet for these …AND STATE SURVEY disks having UNK (unknown) as the setting date. So, this could have been an error made when the original record was typed into a computer record. A former NGS State Advisor to NJ presently works in NGS so I asked him if he knew when these …AND STATE SURVEY disks were set in NJ. He didn’t know, but he did have copies of some old station descriptions and he found the one for “801”, see: http://www.flickr.com/photos/12262796@N06/3405471774/. See the dates 1939 and 1941 in the upper right corner. 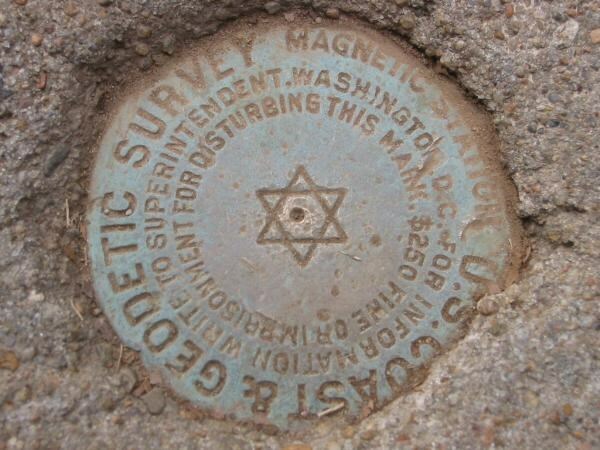 My guess is that the disk may have been set in 1939 and surveyed in 1941. So, even if its 1939 you are still outside the original range of dates I gave for this type of disk of c1933 to c1935 – GOOD WORK! Perhaps you can use one of these, they are different from the other Gravity Stations posted. Unfortunately, I can't provide a PID. I did a search of the NGS datasheets of up to a half mile from a near-by mark CZ2410, and nothing came up. They are both stamped Tucson 1937, one is "A" and one is "B". Odd thing, they are also very close together. Both also have a dent in the disc like they were struck with a sledge hammer or something. Back in the 70s this area had a magnetic observatory and lightning lab from the University. Here is a nice clean, sharp Flat topped BM from 1924 (DX2221 - J 1 RESET). It is set vertically on a building so it has avoided a lot of weather, although it has collected some dings. I have the high resolution version if you want it, let me know. Yours to use as you wish. There seems to me to be a bit of confusion between the datasheet above, and DX2220 - J 1 . The way I read it, the J 1 (DX2220) datasheet is saying that the whole building (including the benchmark!) was moved to it's present location, and re-designated as "J1 (1924)" - essentially a reset, now designated in the NGS database as "J 1 RESET", which is DX2221. Quite possibly DX2220 - J 1 should be destroyed in the database. There is clearly no old building at the DX2220 described location. However, there is at least one loose end: in the DX2220 log entry of 1927: the B.M. is referred to as J 1 (1906). Possibly the datasheet monumentation date for DX2220 - J 1 is wrong, and should have been 1906. If so, and the while building (and disc) was moved, then why is the disc stamped 1924? I'm not far away, and can go by J 1 RESET (DX2221) again if needed. If it there used to be a 1906 disc, too bad it wasn't retained. Would have been an interesting disc (cup type?). Maybe it was destroyed in the building move, and the 1924 disc monumented then (1924? 1927?). I may contact the Chapman College facility management or history departments to see if they can clarify. Look at the two "1"s. The one after the "J" has a serif on the bottom stem, the one in the date does not. That date may have been added later. O maybe they just didn't clunk the dye hard enough when they stamped the date. What does your high res. photo show, any faint ghost for a serif? Looked at the high res. I don't think either "1" is a serif style. Hard to say for sure, but I think they could have been the same die, and they just hit the one for the "J 1" a lot harder. It is way deeper, and much wider at the bottom (but not a true serif). Also, I stopped by there yesterday to look more closely for any sign of a location where an older disc was mounted, but didn't find any sign of an older mounting location. White Reset (FV0403) reference marks were apparently set in 1919 which is inside of your date range and they appear to be flat. This station is fairly close to the Black Hill Reset station. White RM N - flat but bent? Other disc images are in the GC.com logs. The reference marks have large arrows. You may use any of the disk images if you desire and the larger originals are also available for your use if you need them. 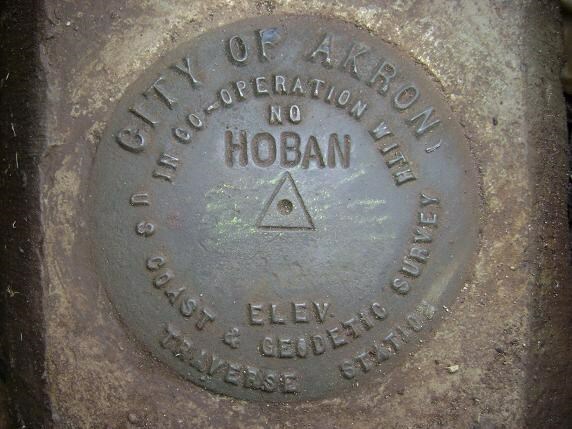 You have mentioned USC&GS/state disks, but here is a variety not listed: "City of Akron in co-operation with US Coast & Geodetic Survey." This is a picture of MB1249 in Akron OH, taken 4-11-09. Although there is no date on the disk, most access covers say "Akron Survey 1963." WOW Shorbird - that is the first CITY and USC&GS disk that I have ever seen!!! Definitely a nice find. Especially interesting because I still have some family living in Akron - I'm originally from Cleveland. Where in Akron is it? BillWallace - Hard to tell, but I think your photos show curved-top disks - I can see some light under the ends of your straight-edge. See: http://www.flickr.com/photos/12262796@N06/...in/photostream/ . The two disks in the photo are dead-flat. They do show that some flat disks had 3 rows of printing. Regarding "J 1", I'm not sure what happened but it does state that the building was moved. I have found a 1916 USC&GS specification stating that the name and date should be stamped on disks, and have seen early disks with no date stamped. So, my GUESS is that the disk was set in 1906 with no date stamped and that in 1924, after the move, the year "1924" was added.